I had a great trip up on the train. I will post photos eventually, but it may not be until I get back. It’s a pretty busy weekend here. I’m lucky to be staying with a friend whose also doing the seminar (she’s done it several times before, too). We had a lovely day yesterday, out walking among trees and along a lakeshore. This morning was a relatively small group on the mat, so tons of personal attention. Immediate, specific, detailed feedback and coaching. Some of it is familiar, some is similar to “how we do things back home,” just presented in different ways, and some of it is flat-out new or different. No pretense of “beginner’s mind” here — I really have to stay open, watch and listen closely, and try to do what I see and hear without thinking about it. Attending to so many things at once is the most challenging part. I remember to irimi behind my partner, and forget to keep my base. Or I keep my base and forget to drop down into the technique. A lot of it is new info, but a lot is also stuff I know, and forget while I’m focusing on something else. So that’s a fun challenge. It’s mentally and physically exhausting. Mostly mentally. I always have this experience when going to a new dojo – everything is different. I’m off to a seminar in the morning. This time I’ll be taking the train from San Diego to Seattle (39 hours each way!) 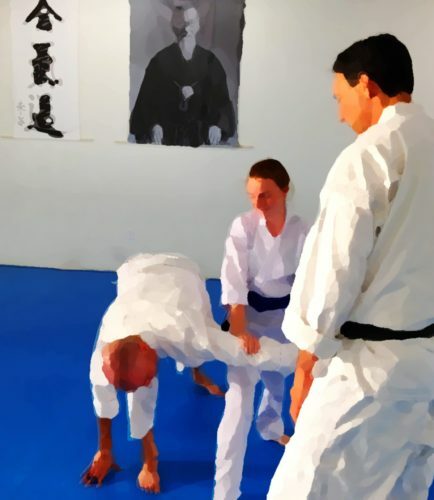 to participate in George Ledyard Sensei’s 2014 Labor Day Weekend Randori Intensive at Aikido Eastside. Funny… My last train trip was also to train with Ledyard Sensei. Cool! I’m just ridiculously excited about it! I’ve been wanting to do both this seminar, and a long train trip, for years. Now I get to do both. Plus I get to meet and hang out with another of my fellow writers on The Mirror team from AikiWeb, Katherine Derbyshire, plus a bunch of other folks. Woohoo! I will be posting a lot for the next week or so. Some of it won’t be directly about Aikido – lots of photos, random observations, etc.. Follow along! I really enjoyed today’s seminar with Richard Moon Sensei and Dave Goldberg Sensei at Aikido of San Diego. The subject was “Aikido is Medicine for a Sick World.” We may not have solved all the world’s woes, but generated some good insights, and maybe made a few connections and shifts within ourselves. Afterward, at lunch, we decided it was a good training for mind, body, and spirit. In related news, I’ve been feeling really overwhelmed and under a lot of pressure with everything I need to get done before leaving for Seattle at oh-dark-hundred on Tuesday morning. I’m determined to have all my preparations done by Monday afternoon before class. Months ago I had a long, complicated nightmare about missing the train, in spite of last-minute scrambling to throw everything together. I’m determined not to live it out in real life. LOL I’ve been feeling pretty stressed about it, actually – sure I’ll forget something critical, or run into some problem that will screw up my trip. Now, after an intense 4 hours of working on dealing with pressure, blending with multiple attackers, and moving into the open spaces, I’m feeling a lot calmer and more capable of seeing and managing the big picture instead of staring in panic at ever little detail (attack). I can see the whole system, and it’s something I can handle just fine. It’s not world peace (yet), but it’s my peace, and it’s a start. We have a seminar coming up at our dojo a week from Sunday, with the teaching inspired by the O Sensei quote “Aikido is medicine for a sick world.” A couple of weeks ago when it was announced it seemed very appropriate in light of the fighting between Israel and Palestine. Right now Ferguson, MO (and many other places in the US) seems to need the same healing and reconnecting. “We’ve done everything we can to demonstrate a remarkable amount of restraint,” St. Louis County Police Chief Jon Belmar said in an interview outside the command post. Restraint? Restraint from doing what? It implies they would like to be more violent, more forceful, but are trying to hold themselves back. It comes across to me as if a large, angry, powerful man had just backhanded a child, and then expects to be congratulated for showing restraint for not beating the kid further. Police must not act out of anger. They are supposed to care for and protect their community. They should act appropriately, and with the least amount of force possible under the circumstances. If they need to “restrain themselves” something has gone very wrong in the underlying thinking. We have lost our collective minds – or maybe our hearts – when somehow two young friends walking down the street at night, bothering no one, escalates within seconds to one of them being shot dead by a man who was supposed to be protecting them. There’s a lot that’s right in the world, but this sickness needs to be cured, and “we” have cure it. We.